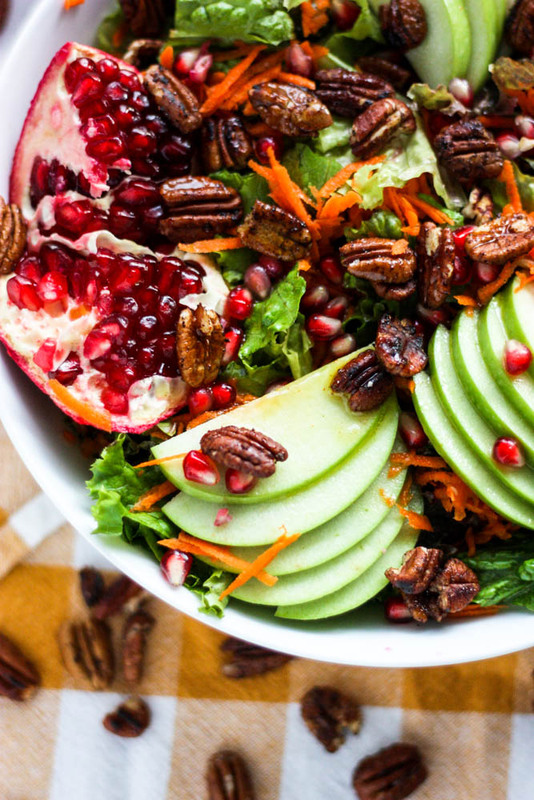 In need of a show-stopping harvest salad? 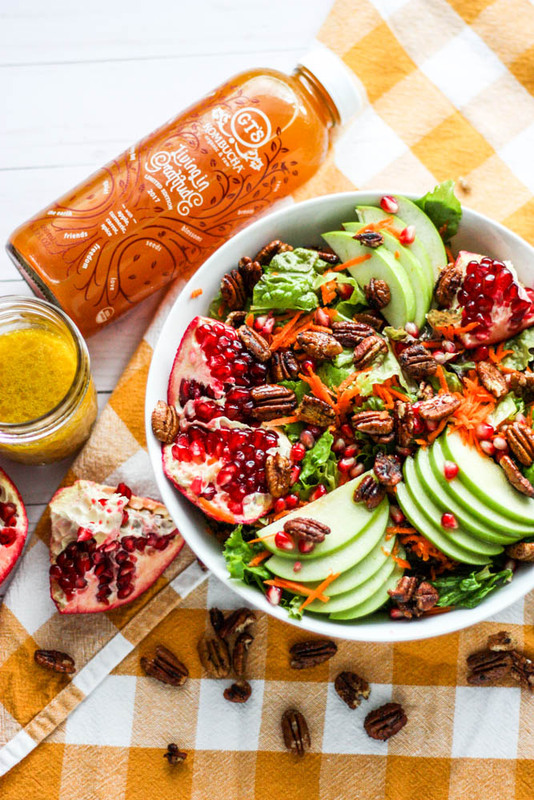 This Apple Pomegranate & Pecan Salad with Sparkling Kombucha Vinaigrette would be the perfect thing to round out any cold weather meal. THIS POST HAS BEEN SPONSORED BY GT’S LIVING FOODS. I’M SO PROUD TO BE PARTNERING WITH A BRAND I HAVE ADORED FOR QUITE SOME TIME, AND ALL OPINIONS REMAIN MY OWN, AS ALWAYS. THANKS FOR SUPPORTING THE GROWTH OF MISS AK! 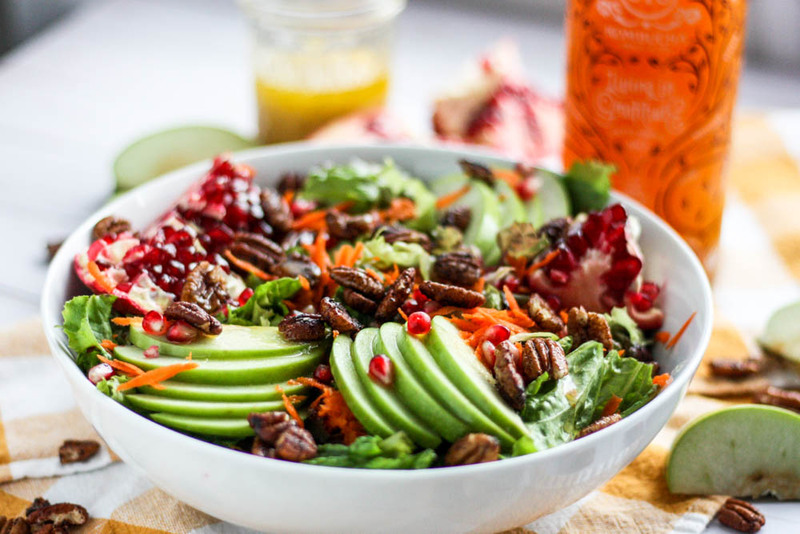 An arsenal of really darn good salad recipes is a very important thing to have. 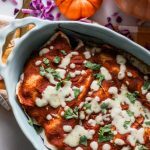 I think this is right up there with knowing how to make a really great cocktail, knowing how to make marinara sauce from scratch or make rice actually taste flavorful. If you’re anything like me, and you attend as many dinner parties as you throw, you probably have had the salad question thrown at you. 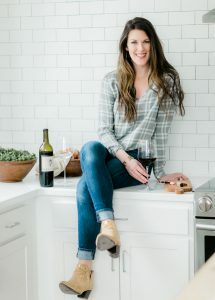 You pick up a bag of romaine from the store, try to find the dressing with the best ingredients and head on to your party, sort of glumly glancing at the absent creativity in your bowl. Well, HAH! No more my friends. 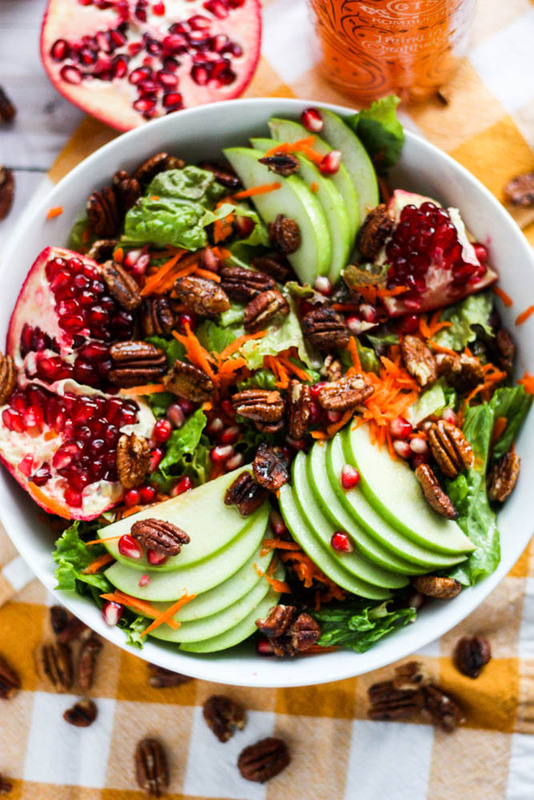 Salads are easy enough to throw together, so why not kick it up a notch and put a little leafy pep back in our steps. 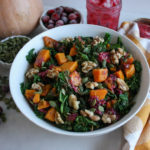 With just a few ingredients we’re going to kick this salad game from snore fest to GLORIOUS and I promise you, it’s going to be a recipe you’ll be keeping in your back pocket all fall and winter long. 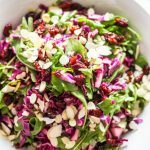 If you need another salad idea, I posted this Purple Cabbage and Arugula Salad with Easy Dijon Vinaigrette the other week, too! I take this salad thing, and homemade dressing, very importantly my friends. 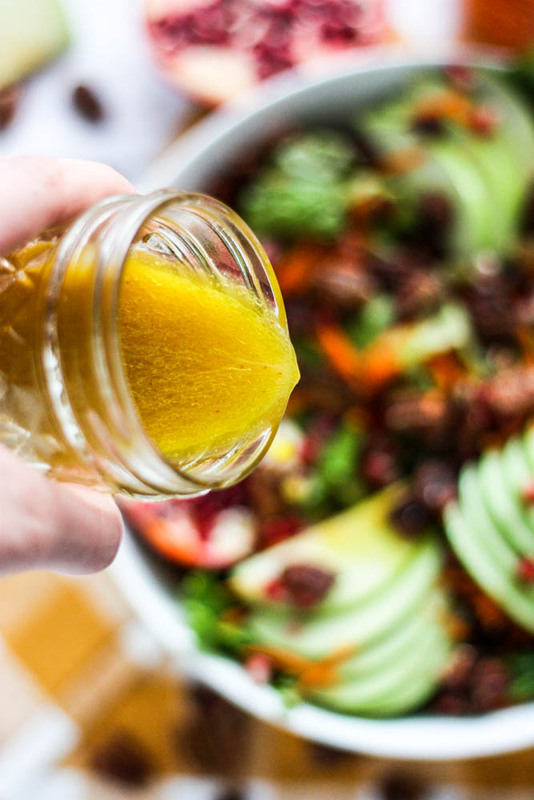 Speaking of the vinaigrette, it’s stupid easy. You combine GT’s Living in Gratitude Kombucha, olive oil, dijon and a bit of honey and shake in a jar. Boom. Done. 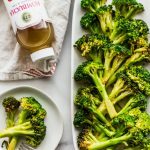 Probiotic filled and bubbly dressing thanks to GT’s Kombucha. I mean, come on. Does life get better? Start by making the sweet and spicy pecans. Place the pecans in a small saucepan and toast over medium-low for about 3-5 minutes, until they’re just fragrant. Add 1 teaspoon of the honey, cinnamon, nutmeg, and 1 dash of cayenne and toss well so the nuts are coated. Remove from the heat and set aside. 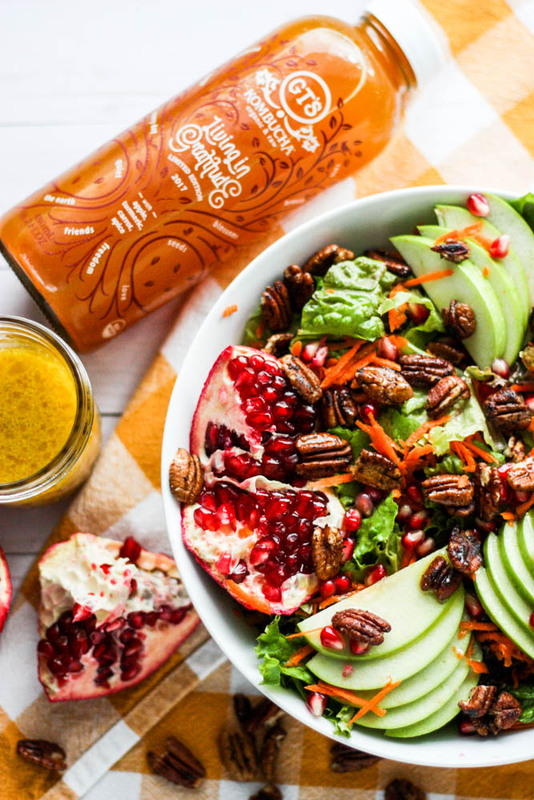 To make the dressing, add the GT’s Living in Gratitude Kombucha, olive oil, Dijon mustard, the remaining teaspoons of the h0ney, the remaining dash of cayenne, salt, and pepper in a glass jar. Whisk well to combine. If you have to shake this to mix it really well, do so with caution because the kombucha can get quite bubbly! 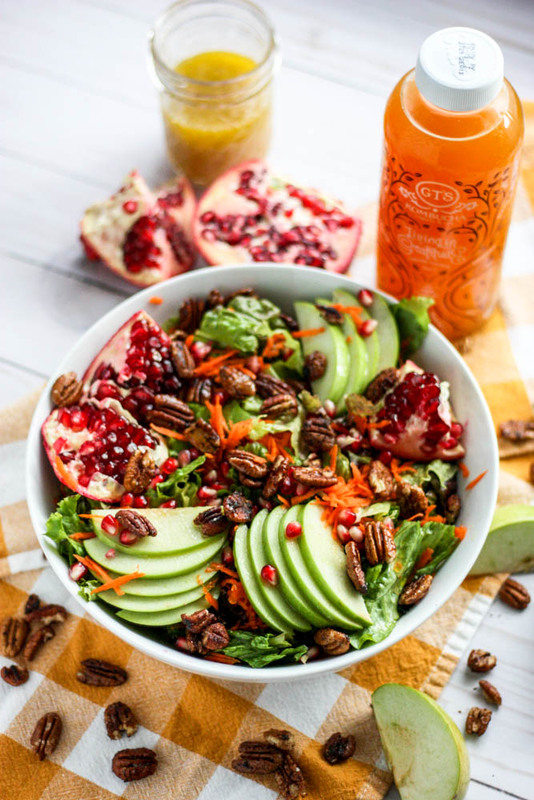 Chop the lettuce, shred the carrots, chop the apples and de-seed the pomegranate. 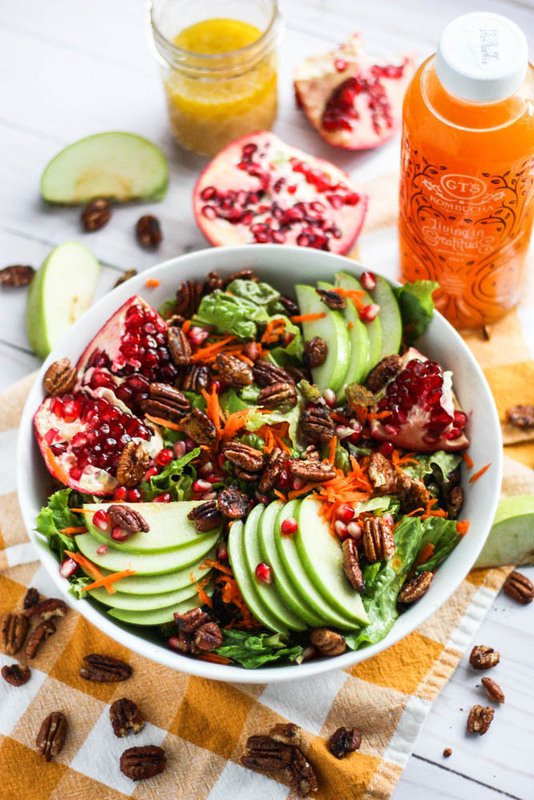 Add everything to a bowl and top with the pecans. 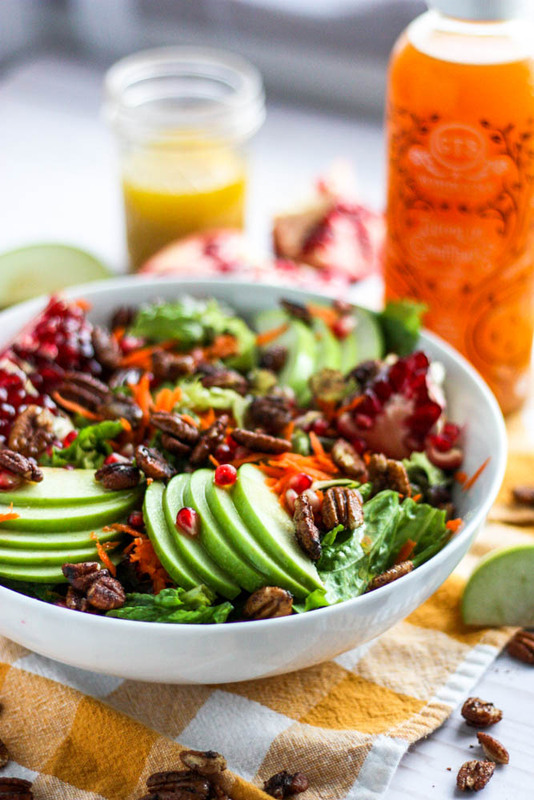 Pour the dressing over the salad and mix well. Serve up! 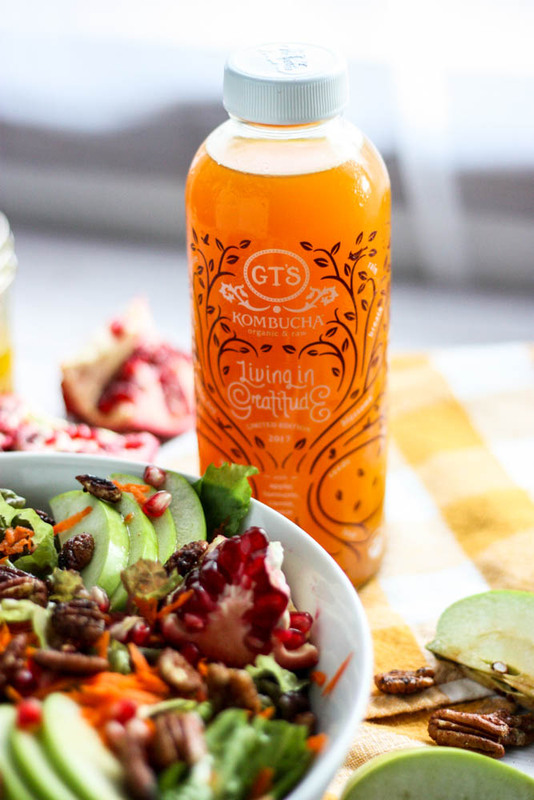 If you make this recipe or try the new Living In Gratitude flavor between now and 12/31/17, be sure to Share a photo of the bottle on social media with #LivingInGratitude and tag @GTsKombucha. For each post, GT’s will provide 10 meals to those in need—up to 500,000 meals via Feeding America.